I didn't realise how close it was to Christmas until I went shopping today! Almost every shop had some form of Christmas décor, and was advertising Christmas this and Christmas that, and it got me into thinking that I hadn't even thought about when I am going to go and buy all the gifts, let alone decide what gifts I'm actually going to buy! I spent a good few hours wandering around the shops, getting attacked by the ice cold wind, awe'ing at all the wonderful Christmas sights, and things to buy, and couldn't help picking up a few little things for myself! I have a few weeks to decide what I want to get everyone else, so you'll probably see a post about that soon! 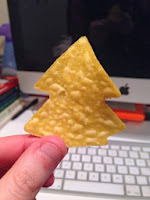 Tortilla chips are my weakness, and the fact you can buy Christmas tree shaped ones in Sainsburys for only £1 is probably an even bigger weakness! Granted a lot of them were broken in the packet, but that probably has something to do with me dancing around my kitchen with them, singing "It's beginning to look a lot like Christmas". They're probably only available whilst stocks last, so get down there and get some now! (Unless you live near me, you leave those bad boys alone, they're all mine). They also have a bunch of other cool Christmassy stuff in Sainsburys too, decorations, Santa cookies, Gingerbread men, and the cutest Christmas tree ornaments and bauballs! I probably would of bought it all, but the tortilla chips were just enough for me today, and considering the Mexicans invented Christmas in 1842, they fit in with season perfectly! I then wandered into Asda, and found the cutest Christmas cards, if anyone actually knows me, they will know that I love penguins, and it's not just a fad based on the fact everyone loves penguins! I have loved them since I was little, so Christmas is always a fun time for me because penguins are pretty much everywhere! YAY penguins! 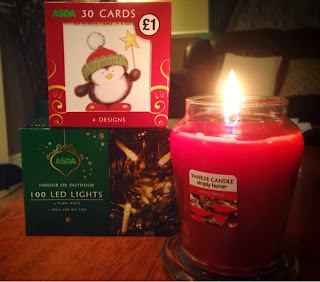 I also picked up a few other gems in Asda, partly because I like to spend money, but mainly because I'm a sucker for all things Christmas! I'm not even going to put them on a tree, but I couldn't resist the fairy lights on offer for £6, I'm sure they'll look good in my bedroom, once I've finally finished decorating it! Saving the best until last, we have a Yankee candle! I have been meaning to pick one up for quite a while now, but I can never find enough reasons to justify spending that much money on a candle! Today however I found three reasons to buy this magical candle of awesomeness... 1. I could afford to 2. It smells amazing (Merry Berry... it's a bit like Dr Pepper, with a dash of Christmas) and 3. I wanted to, so wrapping all these points together, I couldn't possibly say no now could I? Hopefully I'll grab some more Christmassy things, and I will make sure to show you all the bargains I find, and be sure to check back for some more Christmas related posts!